On Wednesday, April 7th, the Color Theory: Design & Science class taught by Ellen Evjen went on a field trip to the Gowanus Canal in Brooklyn. The students met with Christos Tsiamis, EPA’s Project Manager for the site, and Katia Kelly, a local resident who writes the daily Brooklyn blog “Pardonmeforasking” and who is a Parsons graduate. Mr. Tsiamis gave the students a brief history of the canal and an overview of the remediation process. Both Mr. Tsiamis and Ms. Kelly stressed the need for community activism coupled with a scientific framework to improve the environmental conditions in the Canal. The students visited EPA’s sample processing facility where they saw how the sediment cores were processed in order to obtain sediment samples. The scientists at the facility showed the students their “Munsell Color Charts for Soil” that they use to describe soil samples and they discussed other visual indicators used to categorize the sediment. 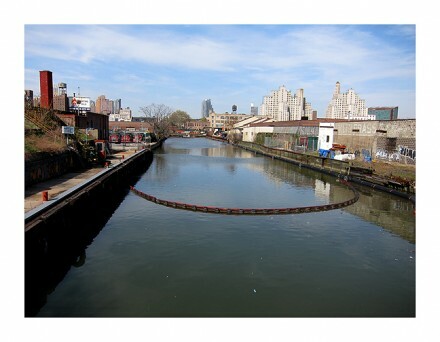 The students are working on projects about the cleanup of the Gowanus Canal. Specifically, they have been asked to use color as a means of visually conveying to the community the results of the environmental cleanup of the Canal.